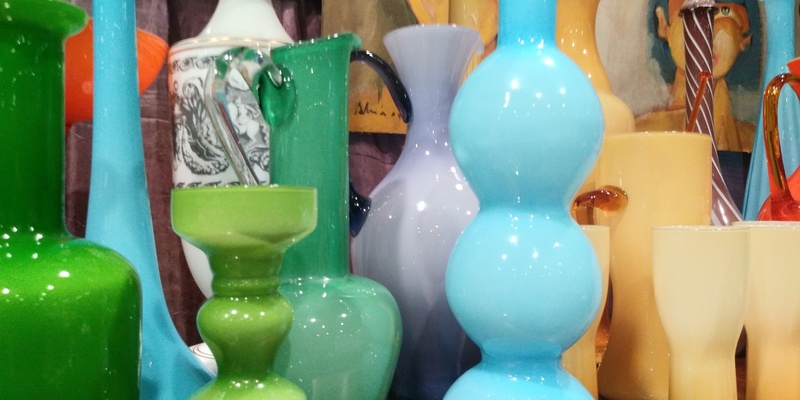 Spring 2019 Vancouver Rummage Sales, Flea Markets and More! There is so much to love about springtime in Vancouver, but for me it is all about the the various secondhand shopping events. From Church rummage sales to flea markets and antique sales…this is a wonderful time for those of us who enjoy the hunt for that special something or even just a practical everyday item. 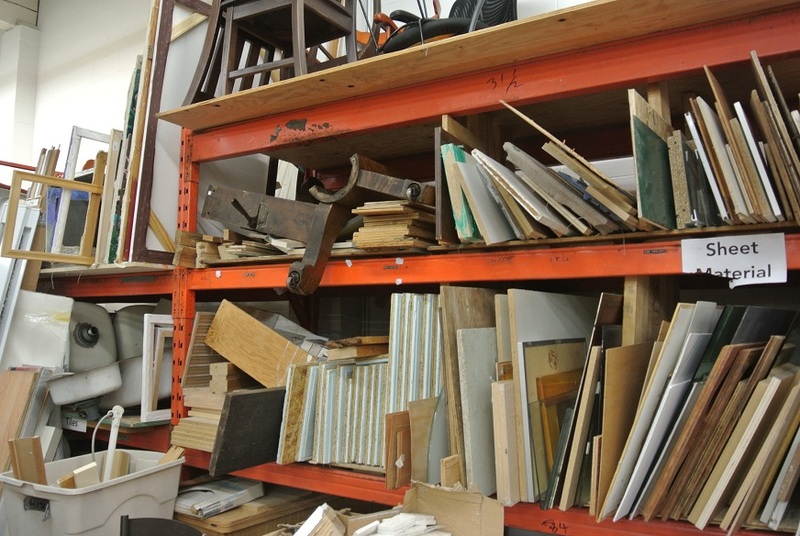 Whether you like to refer to it as secondhand, gently used, previously loved, vintage, or antique — it is something that you are keeping out of a landfill and re-purposing in your own way. April 20th, May 4th, etc. At any given point I usually have at least three or four cookbooks in a stack by my bedside. This week’s selection includes Shelley Adams’ Whitewater Cooks: pure, simple and real creations from the Fresh Tracks Café, Marcella Hazan’s Essentials of Classic Italian Cooking, Patricia Wells’ Vegetable Harvest, and my latest fun acquisition, Edna Staebler’s Food that Really Schmecks. Mennonite Country Cooking. I tend to read cookbooks like other people read magazines. At night, and sometimes in the morning, I will go through each of them slowly, hovering over beautiful photographs and interesting stories, usually marking off pages with bits of scrap paper or sticky notes; highlighting the recipes I want to try next and making notes of some helpful tips and techniques. After a few days I will carefully put them back in their designated bookshelf or stack, and pick out a few more. They are my escape. But also, my inspiration. From these books, I have learned to become not only a better cook, but a more relaxed one. Cooking has become my way of de-stressing – a mindful practice that starts long before I enter the kitchen. 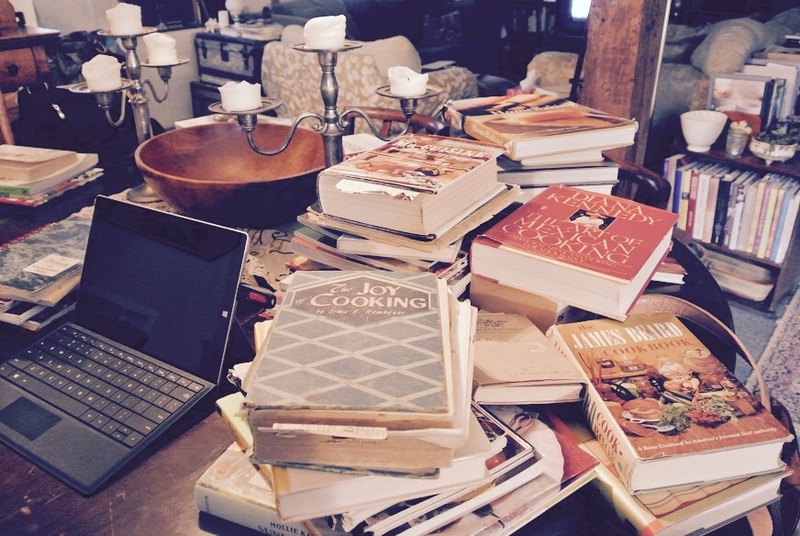 It begins with the hunt for new and interesting cookbooks. And by new, I mean new to me. 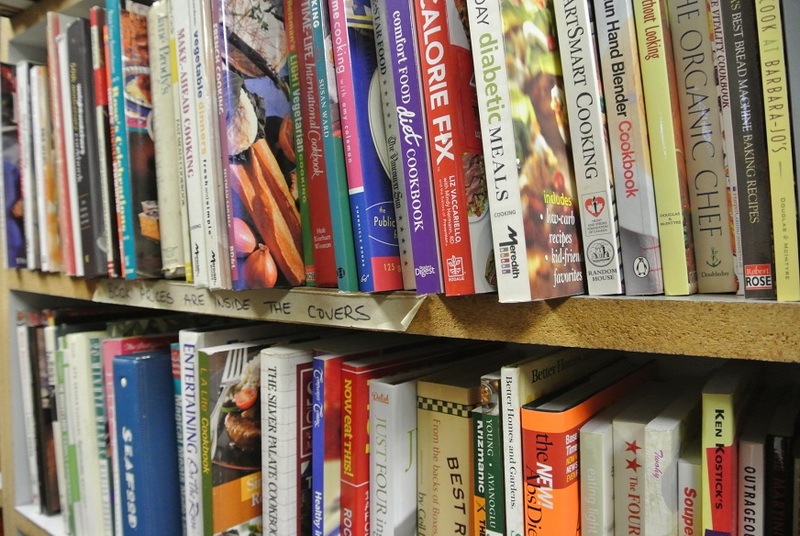 I prefer to find cookbooks in thrift stores, garages sales, used bookstores, as well as at garage sales and church rummage sales. I especially like it when someone has already marked off their favourite recipes with notes and suggestions. This way I know which recipes to try first. I also enjoy attending cookbook launches where the author is present and I can purchase their latest book. I love hearing their stories first hand as well as learning about their personal journey with the publishing process. I am usually the one in the back with my hand up asking a bunch of questions. Which recipes stand out most to you and why? Do you have a favourite cookbook (other than your own), and if so which ones and why? The last question usually leads me on another hunt if I don’t already have the cookbook they mention. From them I have learned about highly respected cookbook authors such as Patricia Wells, Paula Wolfert and Judy Rodgers. And sometimes the answers are surprising and fun. 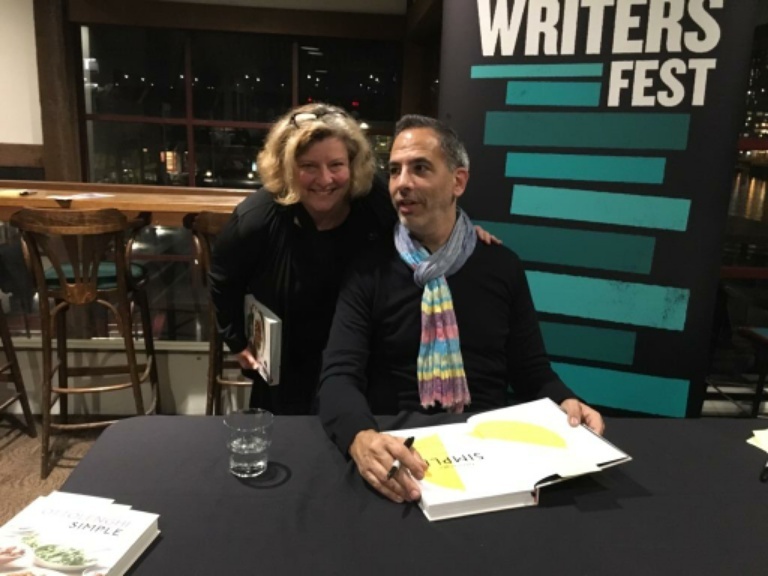 Recently I had the pleasure of meeting Yotam Ottolenghi when he came to Vancouver to promote his latest cookbook Simple. When I asked him what his favourite cookbook was, without hesitation he said “Nigella Lawson’s How to Eat.” I have a few of her other cookbooks, but not this one. So a new mission is afoot! And all of this has further deepened my love affair with cooking and cookbooks. 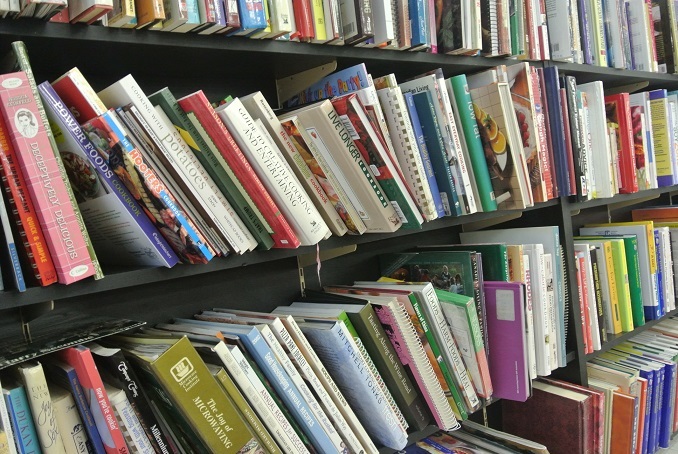 With so many recipes and cooking information available on the web, I am often asked why I still bother to purchase cookbooks. My answer is simple, I don’t believe that print is dead. Especially when it comes to cookbooks, new and old. Although you can go online to find just about any recipe, it doesn’t give the whole story. A digital search works just fine when in a hurry as it is efficient and practical, but it lacks the piece that provides the context and the extra bits of information that I love so much. And where would I put my sticky notes? 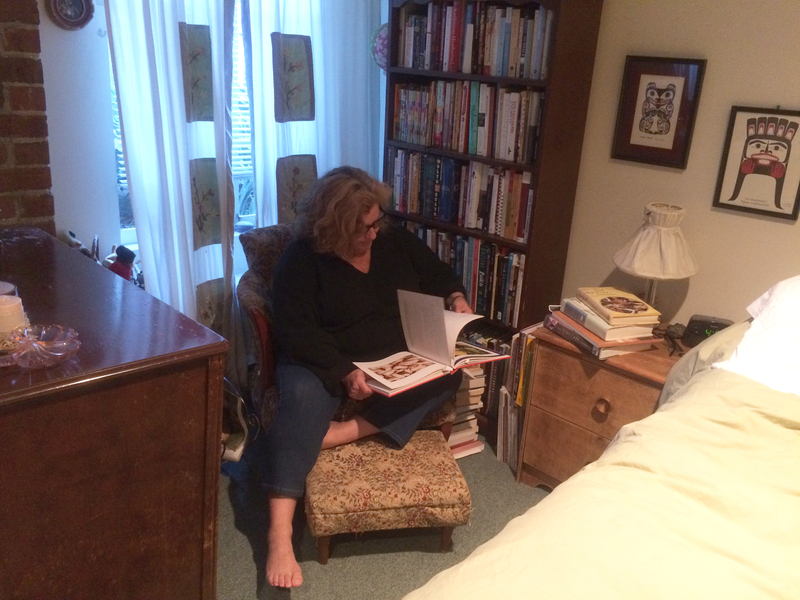 Working on cataloguing my cookbook collection. Good cookbooks evoke a sense of place and time, providing us with a picture of how people live. They preserve traditions and recipes, capture stories, and are entertaining. They also encourage us to find our own voice in the kitchen. This has certainly been true for myself. I will continue to add to my rather large collection of cookbooks while also finding new and wonderful recipes to try. There is always room by my nightstand for at least one more! 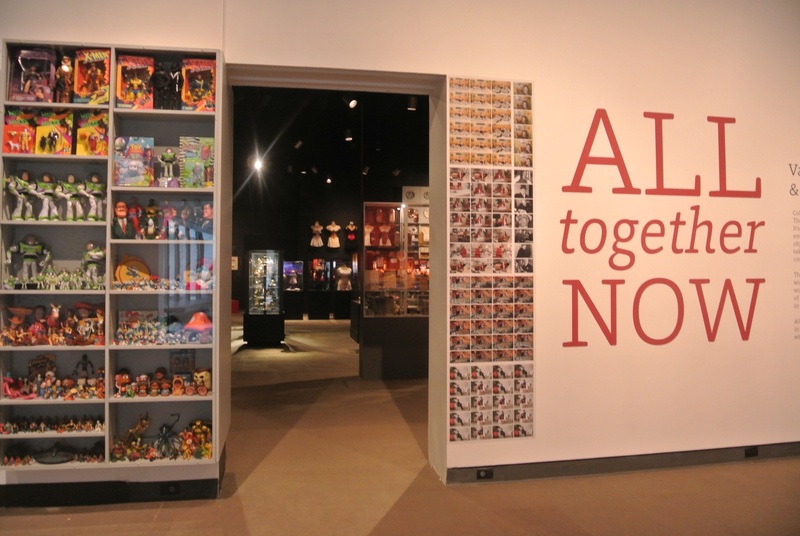 Museum of Vancouver’s All Together Now Exhibit: Curating our history, one collection at a time. This is what was written at the entrance of the Museum of Vancouver’s (MOV) exhibit that featured 20 Vancouver collectors and their rather unconventional collections last year. It was a beautifully curated show that invited visitors to enter into the fascinating, and sometimes unusual, world of collectors. Guests could also become part of the show by sharing their own collections on red and white post-it notes that were placed on the walls around the entrance and through a digital display that featured contributions to the hashtag #MyCollectionatMOV. 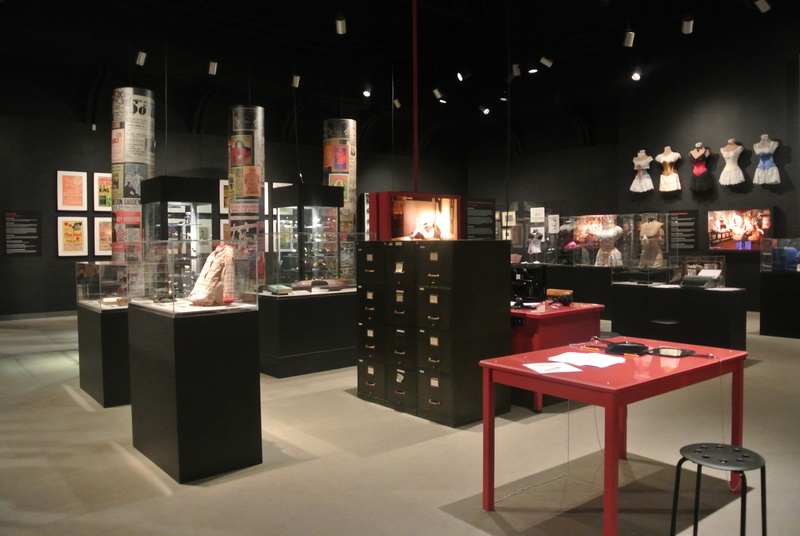 This eventually led to the idea of a group exhibit that would explore “the act of collecting, the collector’s vision and the role collections play in building identity, public memory and social connections.” But more specifically, it was meant to potentially provide insight into the questions of why people collect and if private collections affect public consciousness in any way. When asked which collectors stood out for her, Gosselin had many but highlighted three in particular: Melanie Talkington, Rob Frith, and Kyle Seller. Gosselin was impressed by Talkington and her collection of corsets. 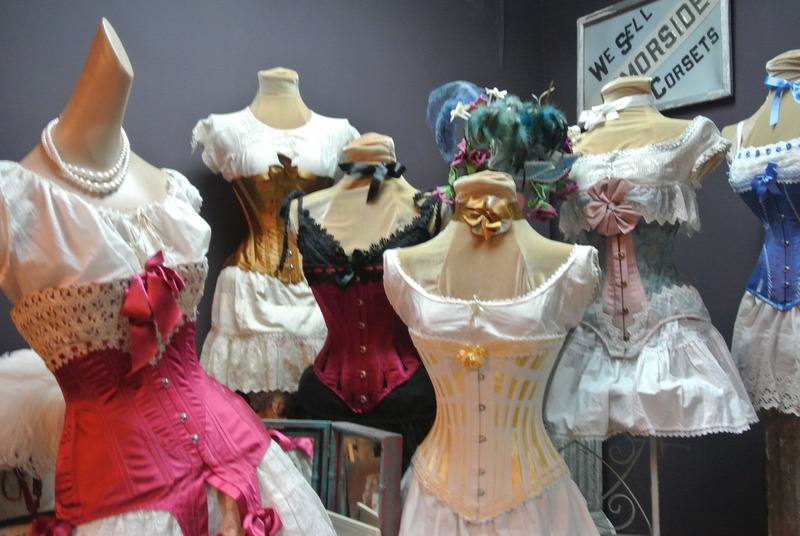 “She learned to make corsets by deconstructing them and turned her collection into a viable business.” Talkington, who has been making, selling and collecting corsets for over well 20 years, owns Lace Embrace Atelier, which is located in Vancouver. 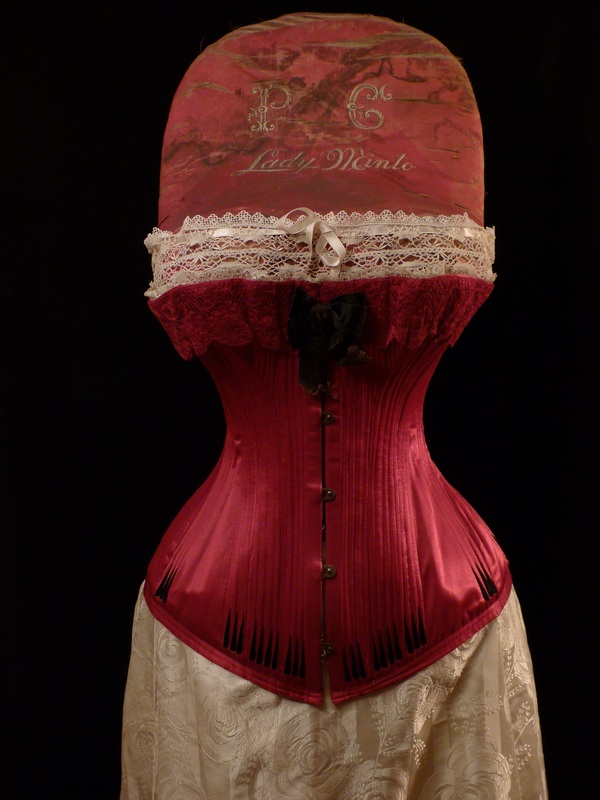 From her very first purchase of a red wool corset in 1997 and after years of collecting, it is no surprise that she is considered a corset expert and has one of the largest antique corset collections in the world. Sharing her knowledge, and educating others around the many different roles corsets played in our history, continues to be important for Talkington. In 2013, the Louvre Museum in Paris borrowed 40 of her corsets for The Mechanics of Underwear exhibit and plans to make her private collection more accessible to the general public by creating a museum in the back of her retail store. 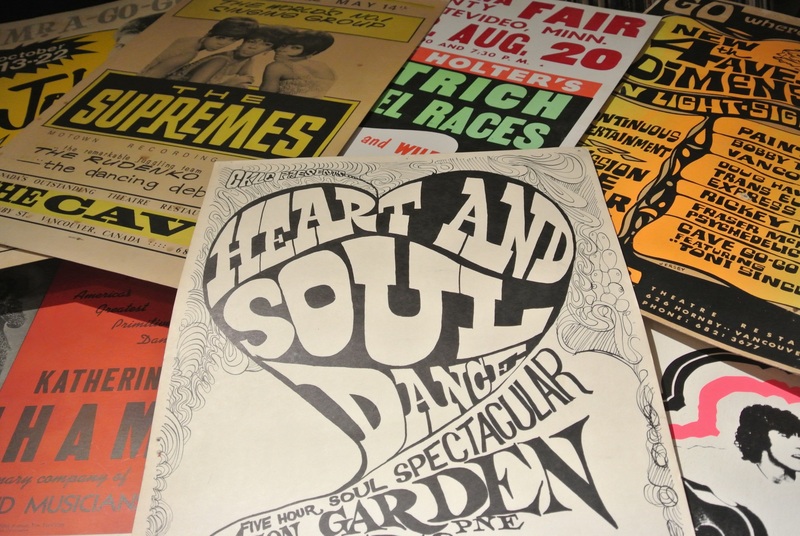 Another, standout for Gosselin was Rob Frith and his display of vintage concert posters. “You can tell music has played a big part in his life.” And indeed it has. Sharing his collection with a broader audience also matters to Frith. “I feel that this collection is important, it is a historical document. I have let people use my posters for illustrations in books, LP and CD releases, newspapers, magazines, television, and movies.” He has also been scanning images of all of his posters and placing them on his Facebook page. Kyle Seller is another collector who stood out for Gosselin. 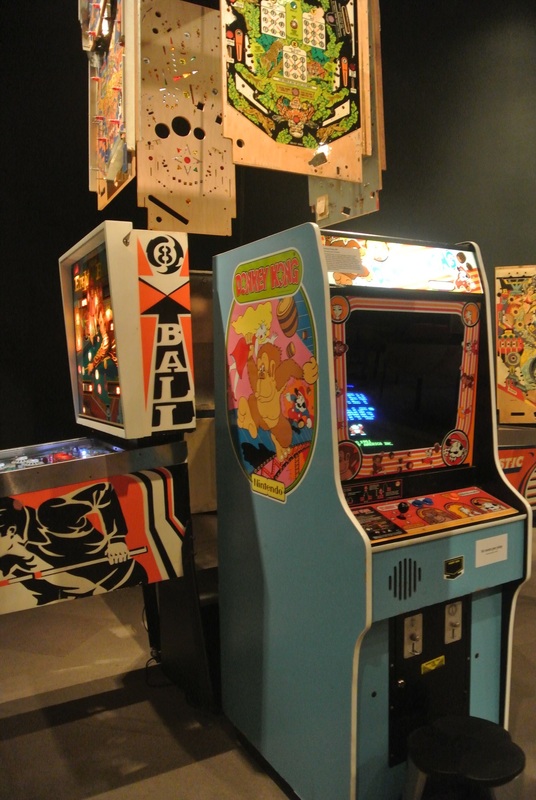 Several of his vintage pinball machines and arcade games were on display at the MOV. All were in working condition and people could play some of them for a dollar or less. 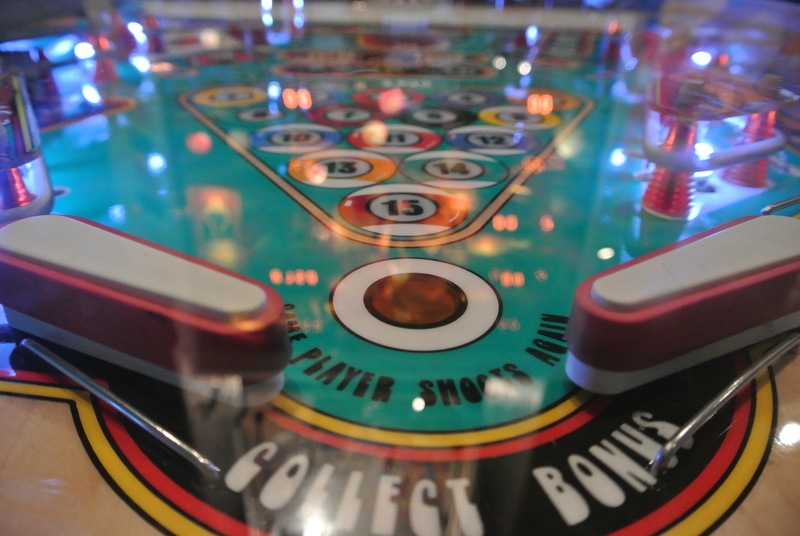 According to Seller, the pinball and arcade market has found new life in Vancouver. 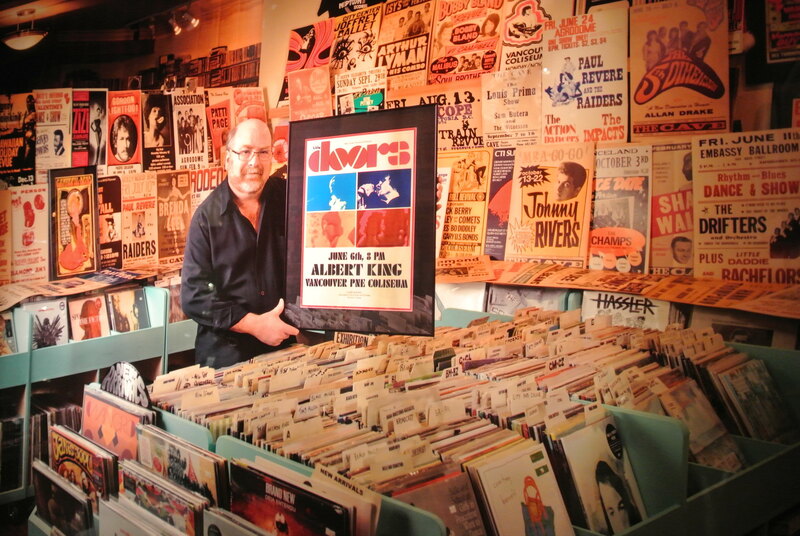 “There are pinball leagues with regular tournaments and a massive culture for collecting.” All of this is good news for Seller as he continues to find new and exciting ways to be a part of that community and grow a business that fuels his passion. Spring 2018 Rummage Sales, Flea Markets and More! 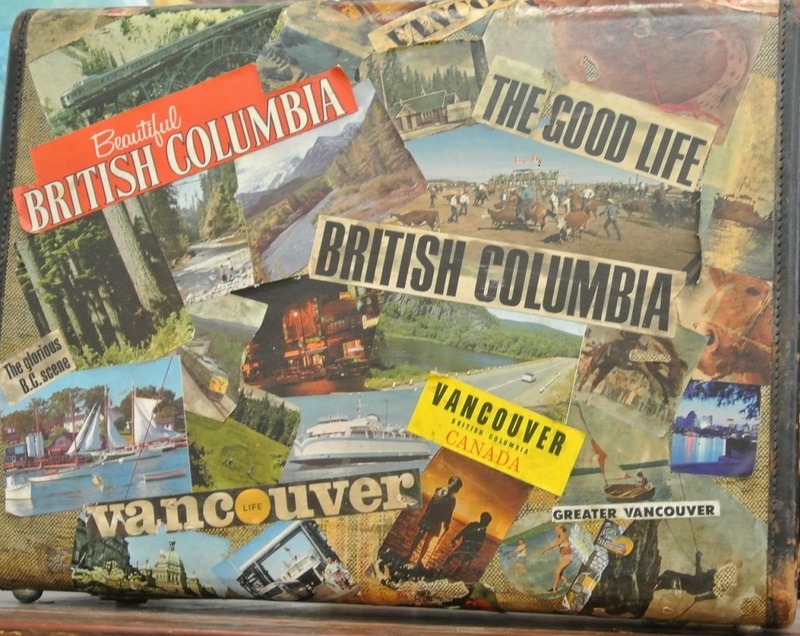 Recently I was reminded that North and West Vancouver are the perfect destination for a secondhand safari. 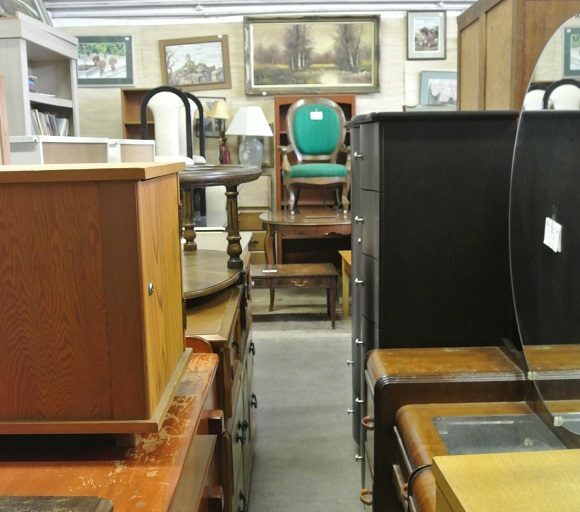 Both communities have a wide selection of secondhand shops as well some of the best church rummage sales in the spring and fall. Most shops are accessible by transit but if you plan to make several stops, might be better to go with friends and organize a fun road trip for the day. This way, you have more room for some of the treasures you will find along the way as well as snacks and water. 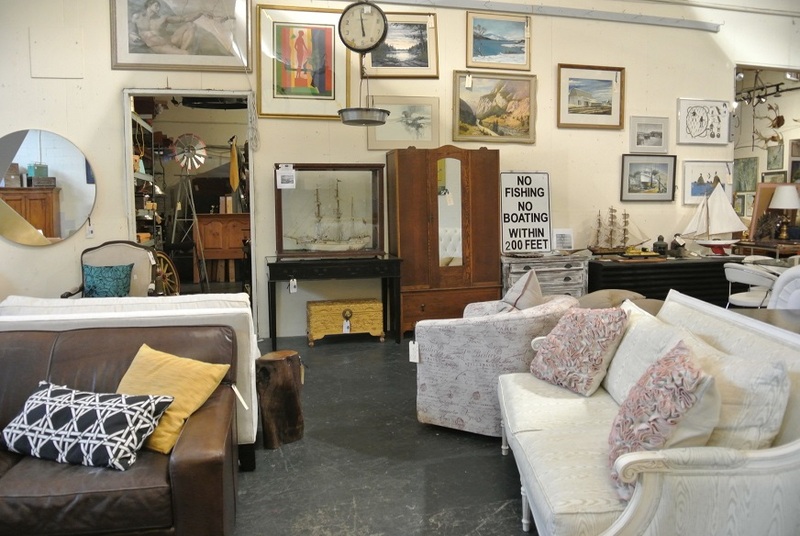 Whether you are looking for something specific, or just like to browse, there are many different types of secondhand shops on the North Shore. 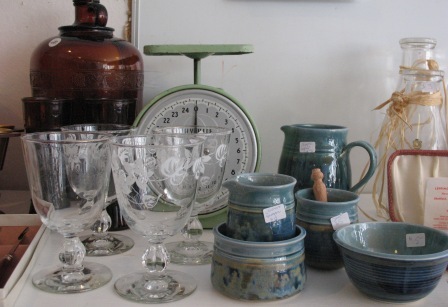 These include everything from thrift stores to consignment and antique stores. I tend to enjoy the thrift shops best and will mostly focus on those for this outing. But I will include a few of the other stores along the way. Case in point, my first stop was at Urban Repurpose in North Vancouver (493 Mountain Highway). This non-profit wants to help people change how the way we see waste. They opened their store last June and have already developed quite a following of both shoppers and donors. And with their rather large warehouse space with their own parking lot, they have an eclectic selection of items that range from building materials and tools to furniture, appliances and housewares to collectibles and unique memorabilia. They even had a shelf full of free books near the entrance. But they don’t just want to sell you these secondhand items, they also want to teach you how to repurpose them and develop new uses for harder to reuse materials. 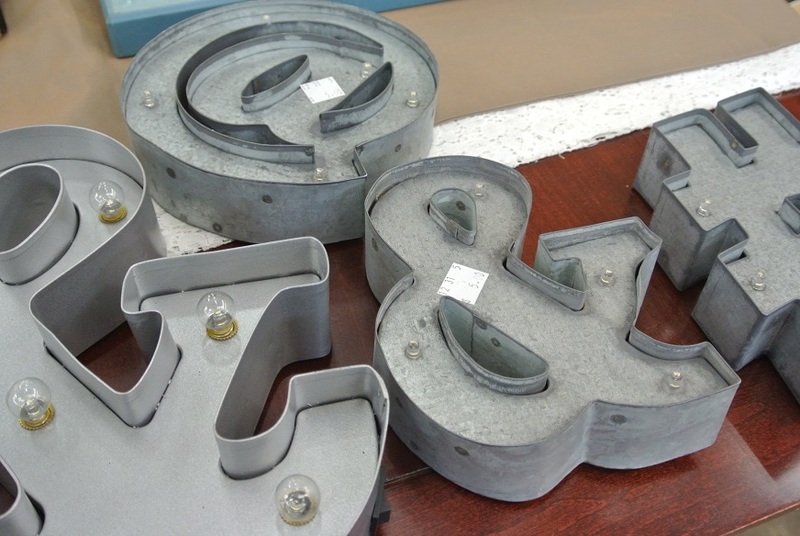 They plan to offer a variety of what they call “upcycling” workshops as well as do public outreach where possible. Unfortunately, they are also currently looking for a new location as they will need to leave this space by May 31st, 2018. From there I made my way to Lonsdale and 15th Avenue and found myself in a small but vibrant thrift shop that oozed a wonderful sense of community that could be felt through the busy aisles. I am referring of course to the Auxiliary to the Lions Gate Hospital Thrift Shop (128 15th Street W) which I quickly learned is a much loved institution on the North Shore. Having been in operation since the early 60s, this iconic thrift store which is run completely by volunteers, continues to be an important fundraising arm for the hospital as 100% of the proceeds (minus basic expenses) go back to the hospital. In 2017, this worked out to just over $277,000. 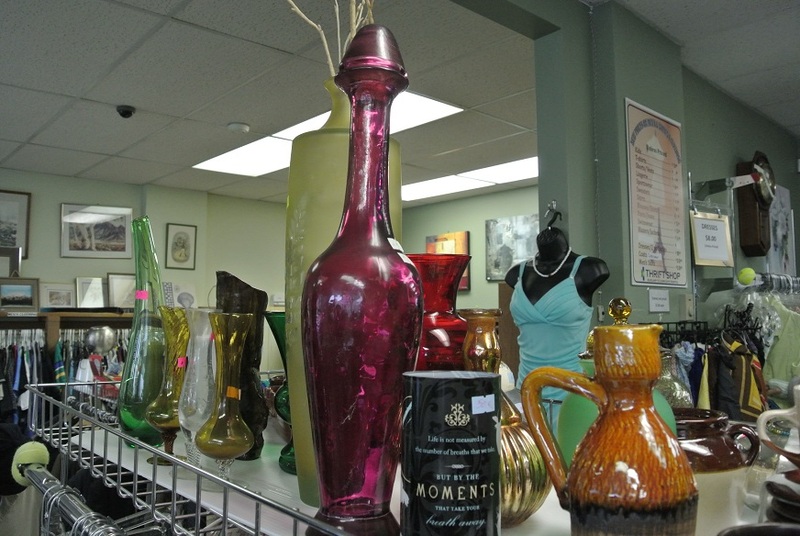 But, they also provide a wonderful service to the community as they carry a wide selection of clothing, accessories, housewares, jewellery, collectibles, paintings, and so much more…all reasonably priced. And the volunteers are incredibly friendly, knowledgeable and helpful…knowing most of the regulars by name. They also make the tiny space work, although I am told they could definitely use more help and a bigger space and maybe one with access to better parking. 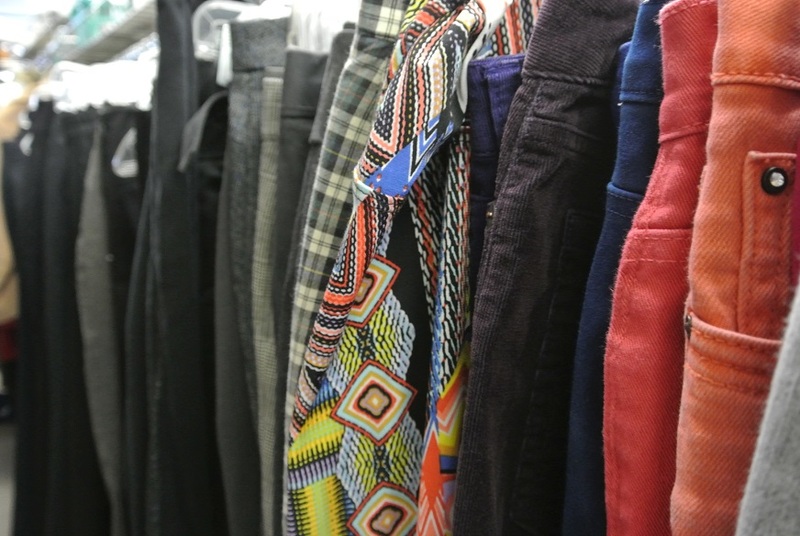 Down the road, just off of Lonsdale and 3rd Street, is The Good Stuff Connection Thrift Shop (154 West 3rd Street). Another small but mighty thrift shop which offers good quality, low cost clothing, footwear and accessories as well as a wide variety of books, toys, and jewellery. Sales help support the North Shore Crisis Services Society programs for women and their children who are experiencing abuse. Next on my stop was the Salvation Army Thrift Store located just off Marine Drive and Fell Avenue (1451 Fell Ave.). This iconic building, with easy parking out front, has two floors filled to the brim with just about everything you can imagine. It is a popular destination with dealers and collectors as they have a well curated selection of jewellery, antiques and collectibles. I was also impressed with their substantial collection of books but was discouraged to find that books were not arranged in any particular category. Made it very difficult to find what I was looking for (i.e., cookbooks). 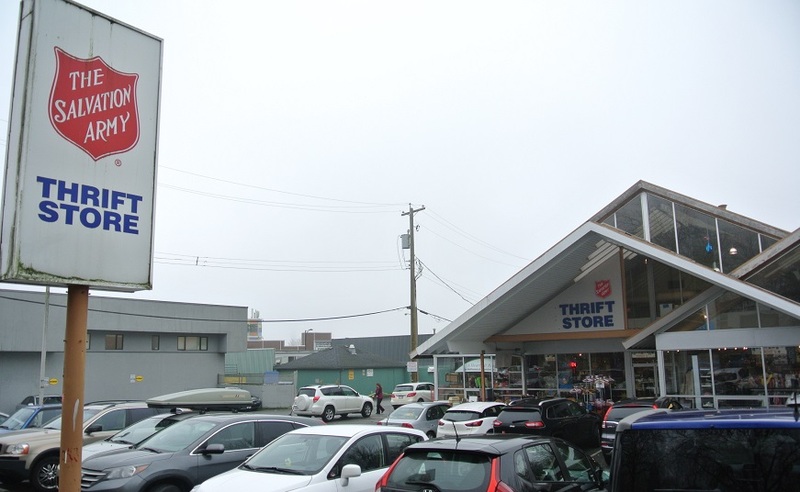 There is also another Salvation Army Thrift Store on Lonsdale Avenue (241 Lonsdale Avenue)…the book section here is organized by category and they also have some furniture as well as housewares, clothing, jewellery, collectibles, small appliances and more. Parking can be a bit of a challenge, but there is free one hour parking on some of the side streets nearby. Over in West Vancouver, you can find their third North Shore location at 1582 Marine Drive, West Vancouver. This location is a bit smaller than the other two but carries a wide array of housewares, small appliances, clothing, accessories, collectibles and a well-organized book section. From there I made my way to the SPCA Thrift Store (1523 Pemberton Avenue) which is found just off of Marine Drive. 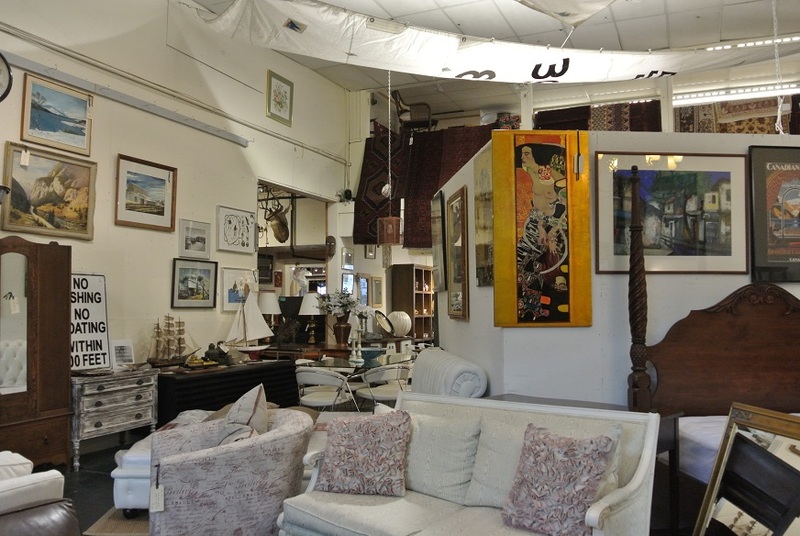 It is an unlikely spot for a secondhand shop, but one that offers ample free one hour parking and a space big enough to have a room specifically designated for large and small pieces of furniture. There is also a nicely organized book selection, a room set aside for housewares and another for china, silver and collectible glassware. But you can’t leave without also heading upstairs to check out clothing and accessories. Last but not least, they also carry gently used pet supplies for every type of pet you can imagine! And, down a few blocks is Consignment Canada (171 Pemberton Avenue). This family run consignment business is well respected on the North Shore, and should be a destination for anyone looking for beautifully crafted furniture. But they also carry a well-curated selection of everyday items for the home and office (e.g., artwork, housewares, lighting, rugs, etc.) as well as some stunning vintage jewellery. If you are looking for something specific, it is worth checking out their Web site as they post pictures of most items that come in to the store and offer some helpful tips on their blog. But, I must say that one of the biggest draws for me is Pepper, their lovely corgi that hangs out in the office but takes time away from playing to greet customers as they come in. Sunday, April 22 from 9a.m. – 3p.m. It is that glorious time of year when many of the local churches and community centres have their annual spring rummage and thrift sales. Here are the dates for the ones that I know about so far. Avid thrift shoppers will be thrilled to learn that Talize plans to open their second BC location in Langley later this summer. This is terrific news on many levels. It means additional industry related jobs, a boost for the local economy, more opportunities to keep recyclable items out of the landfills, increased support for the Children’s Wish Foundation, and of course another wonderful shopping destination for savvy secondhand shoppers. 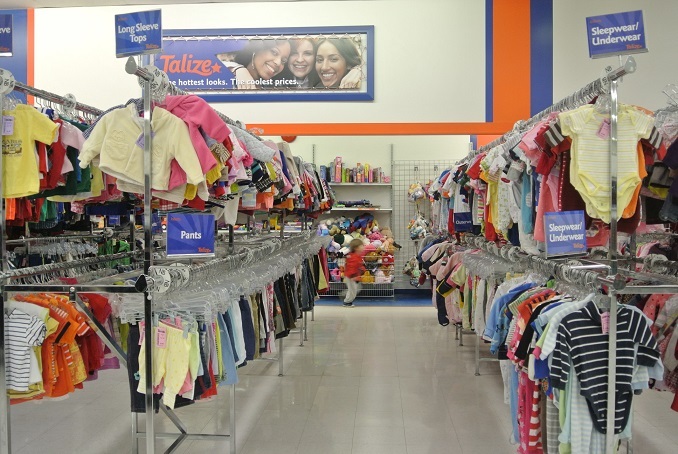 Founded in 2005, Talize is a Canadian owned and operated thrift store chain with seven stores currently in operation (six stores in Ontario and one in Delta, BC). As well as the new store currently under construction in Langley, there are two more being planned for Ontario in Kingston and Barrie. Even Stan herself has what she calls a “secondhand love story”, both she and her husband Eric Nykamp met while working at a rival thrift store before moving over to work for Talize in Hamilton, Ontario. Nykamp started at Talize in 2007 and Stan in 2008. And, in 2010 they leapt at the chance to relocate to BC to manage the Delta store. Nykamp is currently the Store Manager and Stan the Assistant Store Manager. Come this summer, Nykamp will become the District Manager and Stan the Store Manager for Langley. And, true to promoting from within, Stan’s Assistant Store Manager in Langley will be Corrie-Lynn Parries who began working as a part-time cashier at the Delta location shortly after it first opened. Her mother, who also works with Talize, had encouraged her to take a part-time job while still in school. With over 25,000 square feet, Talize is able to showcase a large culturally diverse selection of clothing and accessories for both men and women (beautifully organized by size and colour). They also have an impressive section for children’s clothing and toys, bookcases filled with every type of book that you can imagine, rows and rows of vintage, retro and modern housewares, as well as a small back section with electronics and some small appliances. The store relies on donations to keep itself well stocked with quality merchandise while also encouraging people to keep items out of landfills. 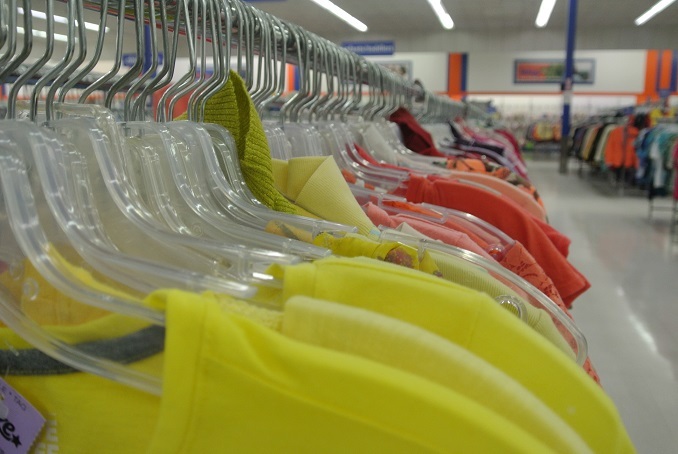 They accept donations of gently used clothing and household goods which can be dropped off in a bin at the front of the store or if it is a larger donation it is best to take it to the back loading area. As a thank you for these donations, they offer donors a $5 off coupon towards their next purchase at the store. There are also several purple donation bins around the city (look for the ones with the Children’s Wish Foundation logo). They cannot accept furniture or any kind of TV screen or baby items due to safety restrictions. According to Stan, this is a high turnover industry with regular customers coming in weekly and many local dealers daily. “In the back rooms, we process 8,000 to 10,000 pounds of stock every day. 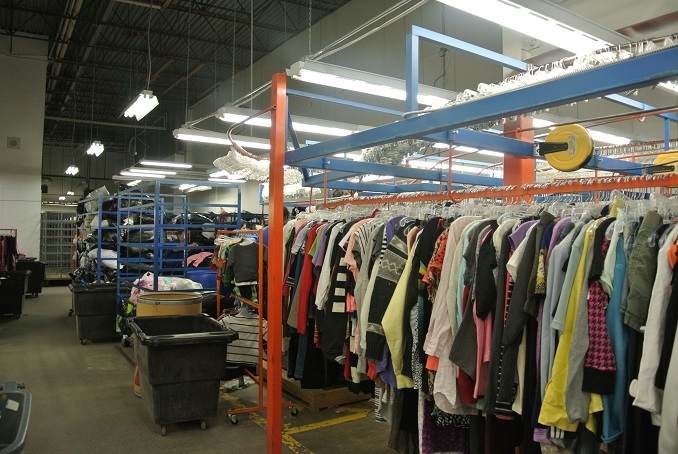 It is important for us to keep fresh items coming out.” As a result, they have a large production team (25 to 30 staff) who are responsible for processing, sorting and pricing all of the incredible donations received on a daily basis. 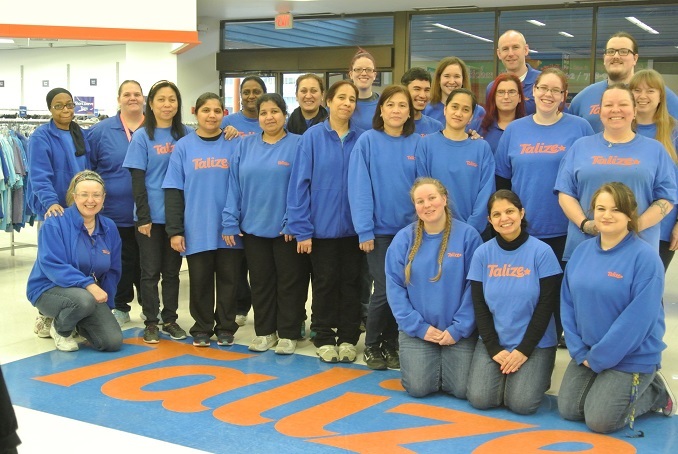 Donations not only support Talize’s commitment to a “greener environment”, they also help Talize raise much needed funds for a Canadian charity. According to Shteinberg, “Talize is a proud platinum partner of the Children’s Wish Foundation and through this partnership, we have contributed over $1.5 Million to date.” The Children’s Wish Foundation helps children, families and communities by granting a wish of a child diagnosed with a life-threatening illness. Talize also likes to participate in local community events such as the Vancouver Halloween Parade. There are many wonderful reasons to consider shopping at Talize, and I would like to add one more…their store wide sale which has everything in the store at half price. The next sale is coming up on Monday, March 27th at all of their store locations. Doors open at 7am until 9pm. For more news on the Grand Opening of their store in Langley, I would suggest subscribing to their Enewsletter and liking their local page on Facebook. I want to share with you all things that support this wonderful lifestyle that I call our "secondhand culture." If you have any upcoming events such as a rummage/thrift sale, auction, flea market, antique show, etc. please let me know and I can post it on this site via Facebook and Twitter. Just go to the About/Contact page and send me the information. Thanks.